Moving to Cuenca, Ecuador meant that mom couldn't go to her yoga classes at One Center Yoga in Asheville, NC to learn from her incredible teacher Cindy Dollar. Mom was all sad about this loss, so I told her not to worry since we could practice yoga together in Cuenca. After all, I do the perfect Downward and Upward Dog poses; remember when I showed Java the other day? I figured though that I needed to learn a few other poses if I was going to practice with mom regularly. I know mom learns a lot from her Yoga Journal magazines, so I decided I should study too. Mom says that in addition to the perfect Downward and Upward Dog poses I do a flawless Mountain Pose... even my jaw is relaxed, and mom tells me this is a good thing which I confirmed by reading mom's Yoga Journal magazines. Mom and I have lots of fun practicing yoga. I've tried to do head stand with her, but I have a bit of trouble with that pose so I created my own. Mom says it is not Iyengar approved, and I have no idea why... I call it the Kissing Upside Down Face pose, and it makes my mom laugh a lot. A month ago mom found an Iyengar teacher here in Cuenca; her name is Lily and she taught kids in Maine. Mom is thrilled; and, although I can't go to yoga classes her, we continue our regular home practice together. And the best thing is that Lily is also a dog agility trainer, so mom got a yoga instructor and I get an agility trainer, all in one person. I can't wait to start my classes. Mom and I feel blessed. All the little pieces are falling into place and we can truly call Cuenca home. I'm about two years old and mom says I'm resembling a teenager trying to be independent and not listening to her and dad all the time when they call. And, as a teenager I guess, I'm learning (or perhaps not) that this may lead to trouble. As you know from previous posts, I just LOVE Parque Paraiso. What is not to love about this gorgeous park, really? And now that I'm allowed off the leash when I go there I can run, smell, and get all the exercise I need and want. We go to Parque Paraiso every day and most of the time I play catch with mom and dad or play with other dogs, if they are around. I'm pretty good and most of the time I come when mom or dad call. But once in a while... well... you know... I may go deaf. The other day we went to the park late in the morning when there weren't that many people around. I had woken up a bit frisky and although I had been running around for almost an hour I wasn't quite ready when mom and dad said that it was time to go. They trusted me and left me off the leash as we started to leave the park. And then we walked by the chickens... we always go past the chickens on our way out. But this time they were not where they were supposed to be, like in the above picture. They were running around the park as if they owned it, and the rooster was up on a metal structure used by people to exercise making all kinds of noises and enticing me to play with him. All the chickens were frisky and so we started a game of chase. I was after the chickens and mom and dad were after me. But then the danger came when the owner of the chickens came after me also and she was very angry and mean. She threw a small stick at me and then she went for a big piece of wood like a 2x4. My mom told her not to throw it at me but she was determined. Finally I decided I better listen and let mom catch me and put me on the leash. Mom was very angry at me and at the lady who was really going to hurt me. She told dad that she probably would have ended up in jail if that lady had hit me with that big piece of wood because she was sure she would have hit the lady back. People had come to watch the chase of the chickens and the crazy gringos and the lady with the stick and they were laughing at the whole thing. I pretended to be sorry but deep inside I couldn't help it ... I had a big smile. Like most Ecuadorian dogs I'm mixed, not a purebred. I'm mostly Australian Shepherd and Border Collie, but I got other three different breeds in me including a tiny little bit of Chihuahua, of which my mom loves to remind me every time she can. She thinks it is pretty funny. The main benefit of looking like an Ecuadorian dog is that I'm not prey to those people who steal dogs. Most people here in Cuenca don't even realize I'm a Gringo dog, except for the fact that I only understand English and I'm still working on my Spanish. Also when we go to the park I do some agility and catch ball like no Ecuadorian dog I know, so I give myself away as the Gringo dog I am. My mom is extremely protective of me, that's just the way she has always been. But, I don't think she has to worry about anybody trying to steal me. Looking average can be a really good thing here in Ecuador, but it doesn't prevent heartaches. Two weeks ago my friend Coco was stolen. 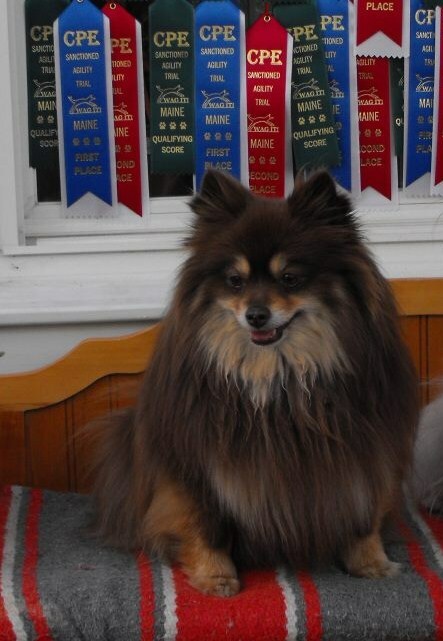 She is a gorgeous chocolate Pomeranian. I didn't get the opportunity to really get to know her. I only saw her in Parque Paraiso once with the rest of her pack: Zoe, Jack, Jimbo, and Dusty. I know I can be great friends with Coco. Coco has won all kinds of agility medals and I'm sure I can learn a lot from her. We all have prayed for her safe return for the last two weeks. If you are coming to Cuenca and you have a purebred dog just be careful. There is no need to be paranoid, not everyone is out to steal dogs. But a bit of extra care is important. Mom passed out flyers about Coco this weekend and she heard from five different Cuencanos about how their dogs were stolen. In every single instance, however, the dogs had escaped their yards and were roaming around the neighborhood. So, it was different than what happened to Coco who was stolen from her yard. My advice: don't talk to strangers and don't leave your house without mom or dad. Cuenca is a beautiful city, yet when we go on our day trips we really experience the magnificence of this country. Three weeks ago Efrain, from MIO Tours, took us to a farm close to the small city of Uña, on the way to Loja. I had the feeling it was going to be a great day, so I was ready to go early and patiently waited for our ride. When they picked us up I quickly joined Java in the back of the car and, as always, we chilled. I was especially happy. Mom had told me we were going to a farm and even when I had no idea what she meant, I somehow knew I was up for a treat. As you can see, Java was also pretty happy. He also must have known we were going to have lots of fun. My mom and dad loved the ride, and mom wanted to take pictures of everything while Java and I just wanted to get to our destination so we could run and play. We climbed and climbed and then went down and down; the vegetation and terrain changing from lush to arid within a few miles. Honestly, I could care less, I just wanted to get to this thing called the farm. On the very top of the climb we had to stop so we could all do our business. Here my dad and Efrain found some St. Bernard puppies for sale. Mom fell in love, of course; so what's new, right? But, even I liked those fellows; thankfully though, they stayed behind. I know what a St. Bernard grows up to be like! After about 2 hours we arrived at the farm. Java and I were so excited we couldn't wait to get out. The farm belongs to an American and it's run by a very nice couple from Colombia. They have animals, fish and crops and lots of land for us dogs to run around and explore. The house is really nice too and they have a couple of rooms for overnight stays. The trout farm was a lot of fun. The fish jump all kinds of ways when they are fed. Of course, my friend Java had to go swimming in one of the ponds while I just went to the edge to check things out; after all, I'm not a water dog. One of the things I loved the most about this trip was that I got to see live Cuys or guinea pigs. I had only seen the dead ones that are cooked by the roadsides. I wanted to go smell these things but mom didn't let me. I wonder why; I wouldn't dare eat one, perhaps just chase them for a while. There was a cute dog that had some puppies and even though she wasn't too happy to have me around, she let mom get really close to take a shot. She had nested inside a tree trunk. These Ecuadorian dogs are pretty clever. The puppies were protected and their mom kept a watchful eye on everyone approaching. Then came my favorite part... for the first time in my life I saw some sheep. Boy did I want to herd them! The funny thing is that I think they wanted me to herd them too. They all lined up watching me while I trembled with excitement. But herding was not going to happen... there was no way they would let me in that pen so I just watch them from a distance. So after hours of running around and exploring the farm I decided to go down to the river and smell the flowers. They were really pretty but I had to be careful walking because there were lots of cacti. And finally it was time to go back home. I was happy and tired when we got in the car, but I'm always on the lookout for things to see. I don't like to miss out on anything... and this time I was specially glad because I would have missed the wild horses. For over a mile, wild horses seemed to be everywhere on both sides of the road. They were gorgeous and to me quite the novelty, so I had to bark at them. I thought I was going to scare them away and watch them run, but some just looked back at us while the others turned around and slowly walked away. So there you have it, another wonderful day planned for us by Efrain who is more than our tour guide; he has become our friend. There are lots of things mom loves about Cuenca. For example, as you probably well know by now mom loves her veggies and there is a store here that many Expats like. It's called Coopera. It's a cooperative of local farmers and there are several locations around Cuenca. You can find lots of organic fruits and veggies there and we can walk to one of their stores so that makes it fun because I can go. They also have good fresh chickens there that mom gets for me once in a while. Then, there is ARCA, an animal rescue organization similar to Brother Wolf in Asheville, NC, where I came from. A few weeks ago they had an adoption event in Parque Paraiso, my favorite park. It was a well attended event and we saw several dogs get adopted. There are many people here who love dogs and other animals. One thing that mom was concerned about when we moved here was that there wouldn't be any recycling in Cuenca. She had even asked a few people and they had said that there wasn't. But when we got here she was pleasantly surprised to find out that not only there is recycling in Cuenca, but that the grocery stores' bags are biodegradable. They also encourage people to reuse them by making them of a material that keeps things really fresh. Mom has to have her spinach and arugula fix every other day. YUK, I have no idea why she has to do that. But heck, it makes her happy, so that's a good thing... Mom was delighted to find that she can buy organic arugula and spinach at the Supermaxi. From time to time, she even tries to sneak in some of that spinach into my otherwise delicious chicken and pasta dinners. But I have a masterful tongue, and I'm able to find the green stuff and put it aside. Then, there is Kookaburra which is a cafe mom and dad go to every weekend. Mind you, they could take me with them; but, do they? Nope! Mom and dad always brag about what they eat there. Mom is especially fond of their apple pie. But again, does she bring me some? Nope, she doesn't; the little piggy eats it all and brings me none! So, there you have it... these are some of the things mom loves about Cuenca. There are some things she doesn't like that much, but I'll share those with you on a later post. Wow! This has been quite the week for me. It started last Sunday when Java's parents brought him to stay with us because they had to go back to Canada for a few weeks. Sunday was fine, although I don't like to share my house or mom and dad, so I had to get used to that. Monday mom and dad took Java and me to the park and I noticed Java wouldn't run much or play with me. Well, he kept getting worse and worse and by Wednesday Java couldn't get up. It was really tough to get him out to do his business. I tried to nudge him up, but it took both mom and dad to pick him up and take him to the front yard. So I, like a good nurse, stayed with him all the time just watching over him from a distance. Mom and I slept downstairs on the floor with Java just to ensure he was OK. Mom and dad were really worried and so was I. I checked on him frequently and smelled him to find out what was wrong with him. Sometimes he didn't like it. Thursday evening mom decided to give him some of her homeopathic remedies. By Friday afternoon when she took him to the vet with Caty, my groomer, he was all better. We were all touched by Caty's generosity and her caring for Java's well being. She took mom and Java to the vet she uses, Dr. Fabrizzio Guerrero who according to my mom is also a very caring and competent vet. I guess I will have to go meet him soon. Yesterday I had a conversation with Java about doing yoga. I told him that he wouldn't be in this situation if he practiced everyday like I do with my mom. I even showed him how to do my favorite pose, but as you can see, he wasn't interested in the least. Thankfully Java got all better, and he is now running around like nothing happened to him. But that was not all that happened this week. Remember our defender, Scarface, well Monday he came around and he had a really bad wound. My mom cleaned it and used some of her natural stuff to help him out. But she wanted to take him to the vet. Scarface has an owner and so dad reminded her that she wasn't supposed to take another person's dog to the vet without their knowing. Mom was devastated and I sympathized with her because poor Scarface's wound was really bad. Mom fed him, as she always does, did what she could about the wound and then let him go, praying that the owner would take him to the vet. The next day it was obvious that he had not been taken to vet, and there was no stopping mom. We all had to go see Scarface's owner and mom begged him to take him to vet. She apologized for getting involved in his business and told him she just couldn't help herself since she was afraid Scarface was going to lose his eye. He said he would take him in 20 minutes. Mom and dad knew that, unfortunately, he was not going to do it. Many people here in Cuenca just tell you what they think you want to hear. So mom kept doing what she could for Scarface who didn't seem to be bothered at all by his horrible wound. It's amazing how strong dogs are here in Ecuador. Scarface is my friend and I felt really bad for him, but I didn't fret like mom did. She needs to learn that she can't change the world, that the only person to change is herself, but this seems to be a really hard lesson for her. Yet, after all these heartaches, the week ended better, thank God. Java is all better. Scarface's wound has continued to improve; and, yesterday we went to see Luna's pups. I really like puppies except when they pull my tail or try to bite my neck.They have really sharp teeth, you know? But, even I have to admit that these pups are very cute. After playing with the pups we went to Parque Paraiso and, as usual, I loved it! I even met a new friend so that was really fun. Java did well walking to the park and then we both chilled while mom and dad talked to other Americans who gather there every Saturday afternoon. Today my week came to an end in a great way. One of my readers friends, LT, came to Cuenca from the States and brought me some of my favorite treats. I knew the moment mom got the bag out of her backpack and just couldn't wait. I even shared a couple with Java. I can't wait to meet LT and thank her. As I said before, this was quite the week!